Watch pelicans, sea lions and dolphins dance gaily in the turquoise blue waters at Land’s End. 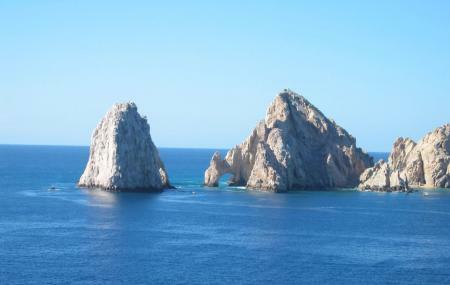 Perhaps the best thing to see in Cabo, this natural arch rises from the azure ocean and is jagged yet beautiful. Famous for its snorkeling, glass-bottom boating and gorgeous views of the surroundings, the beauty of this place is hard to put in words. It tends to get quite crowded by tourists in the high season but a visit here is worth it in anycase. Swimming here is not advisable when the waves are in high tide. Do wear life jackets. You can ask your boat to drop you off at a nearby beach where you can spend a few hours with friends and family. Hire a boat to reach here. How popular is El Arco De Cabo San Lucas? People normally club together Marina Cabo San Lucas and Mt Solmar while planning their visit to El Arco De Cabo San Lucas. People also prefer to start their day with El Arco De Cabo San Lucas. Awesome spot to hit while you're in Cabo. You can get a water taxi to take you from the marina for a quick trip and just a few bucks. Lots of fish and they're almost all glass bottom boats, nice area for snorkeling as well if you're looking to make more time of it. Lots of beachfront bars and restaurants near it as well. The iconic landmark of Cabo San Lucas, definitely worth visiting. You can take a ride from any of the hawkers on the pier, or spend 4x at your hotel to get an arranged trip. Snorkeling might be nice, but even off-season it seemed like there was a dangerous amount of boat traffic. Our driver was skilled, dropping off a couple at lover's beach and getting us to pose for pictures in front of Los Arcos. We went on a boat tour here. It was beautiful. The sea lion colony stunk to high heaven, but was still super neat to see. We spent the afternoon on Divorce Beach right beside the arch on the Pacific side of the island. The currents were to strong for anything other than just ankle deep wading but the children had a blast playing in the waves, and the sand was nice and fine. Lands end is a spectacular view. Get there by water taxi, glass bottom or kayak. Great wildlife and friendly people make this a great place to visit. Don't drink the water. Goes without saying i suppose. Get prepared to take your picture while the boat is moving. There is no stop to get the traditional pic at the arch. I did not realize this until I got there. So, I forgot to take the life vest off. It is weird that every one wants a pic here. But it is a natural rock formation that looks very picturesque in the middle of the ocean.